An Egyptian peasant woman from the southern Nile Valley, 62-year-old Mariam Azmy from Akhmim some 500km south of Cairo, has won the Best Producer Award in the Princess Sabeeka Productive Families Award for 2019. The news were announced by Ghada Wali, Egypt’s Minister of Social Solidarity (MoSS), which had entered Ms Azmy’s work in the competition. Ms Wali said Egypt has received an official invitation from the Labour and Social Development Ministry in Bahrain notifying that the winner, Mariam Azmy, will be handed the award in a ceremony to be held in Manama on 27 March. The award is among three prizes offered by Her Royal Highness Princess Sabeeka bint Ibrahim al-Khalifa, wife of His Majesty the King and President of the Supreme Council of Women (SCW) in Bahrain. The three prizes include the Best Productive Family, Best Producer and Best Patron and Supporter of Productive Families in sisterly Arab countries. According to Ms Wali, this is the fourth time the MoSS participates in the biannual competition of Princess Sabeeka Productive Families Award and the second time to win. In 2012, MoSS won the Best Patron and Supporter of Productive Families Award. Under Ms Wali, Egypt’s MoSS has been giving high priority to encouraging productive families by actively marketing their products through exhibitions regularly held in Egypt’s main towns and cities. The Minister herself opens many of these exhibitions which have, so far, brought in good revenue. Ms Azmy belongs to a productive family that works with the Association of Upper Egypt for Education and Development (AUEED), among the associative endorses by MoSS. 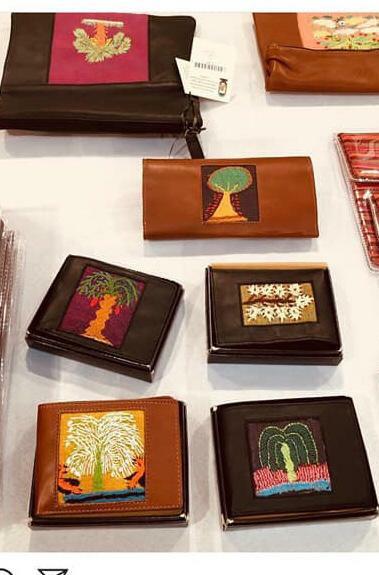 The winning product consists of natural leather purses or handbags that feature the famous, traditional Akhmim embroidery. Akhmim, on the east bank of the River Nile at Sohag has maintained a distinctive age-old style of tapestry weaving the golden age of which was during the Coptic era between the 3rd and 6th centuries when the tapestry was made of silk, wool and linen. Ms Azmy does not read nor write, but is a spontaneous creative artist; her embroidered artworks depict catching natural landscapes. Through her work as a supervisor of art at AUEED Akhmim service centre guides and trains girls and young women. 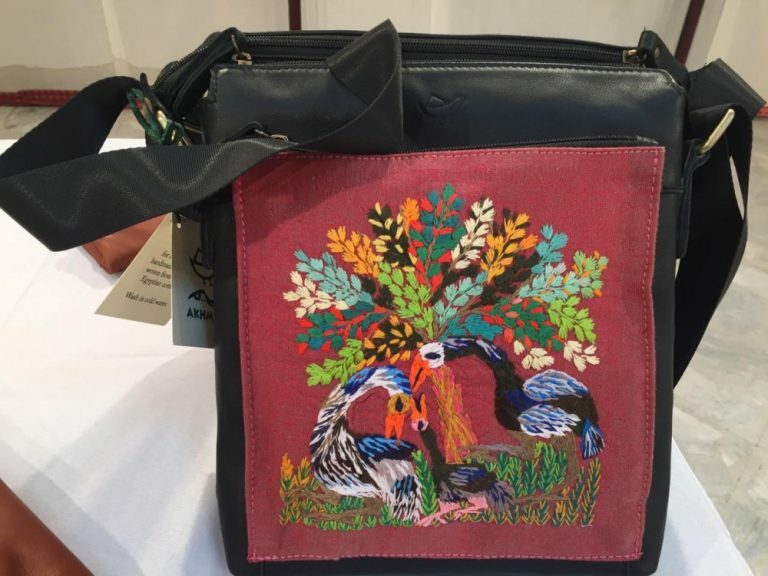 AUEED, founded in 1940 by the Jesuit Fr Henri Ayrout, helps promote and cultivate the abilities and talents of Upper Egypt people in producing art and handcrafts that have been indigenous in their regions from ancient times. The process brings about social development and promotes respect for human dignity and freedom.